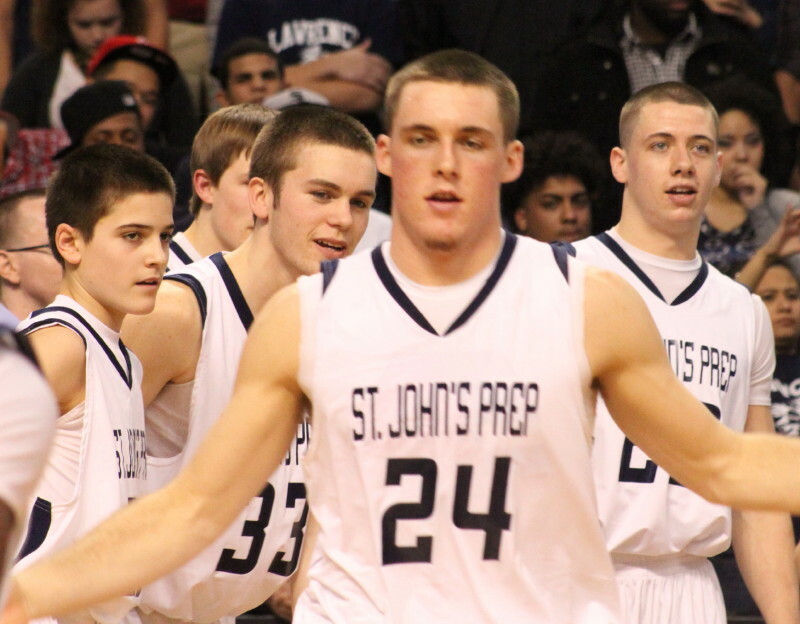 (Boston) St. John’s Prep……….what a team! 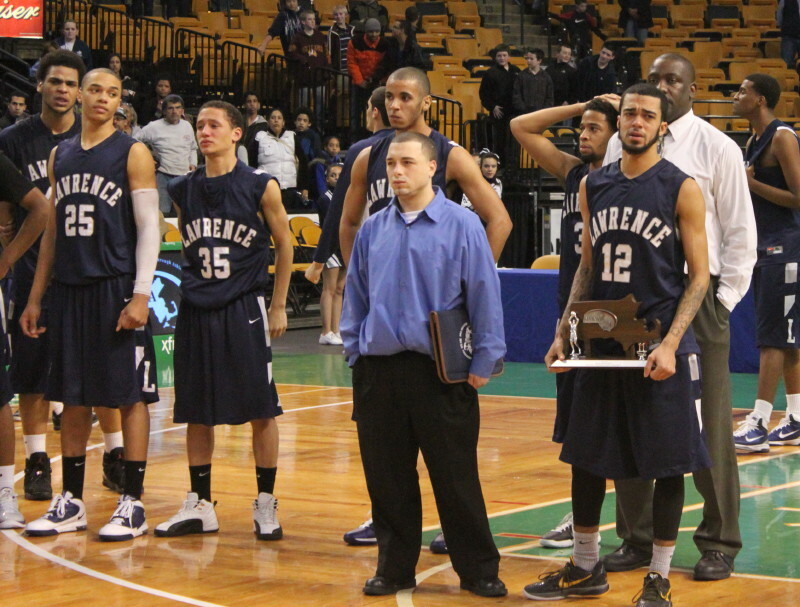 The big stage was their stage as they eliminated Lawrence, 87-73, to take the Division 1 North at the TD Garden on Friday night. The Eagles (23-1) survived the Lancers’ (16-9) best shots in the first half and then gained separation in a dazzling, Mike Carbone-led third quarter. Lawrence was the #15 seed but the way they had upset higher seeds and gained a huge following made them very dangerous. Higher seeds hadn’t been able to stop dart-quick Jaylen Alicea and the Eagles were added to that list. Jaylen (5’8”) put up thirty points on nifty drives to the hoop that got him by outside defenders and over inside ones. In the decisive 3rd quarter things changed. Lawrence could make just three baskets and free throws (10 points) while St. John’s connected on seven baskets and two free throws (21 points). 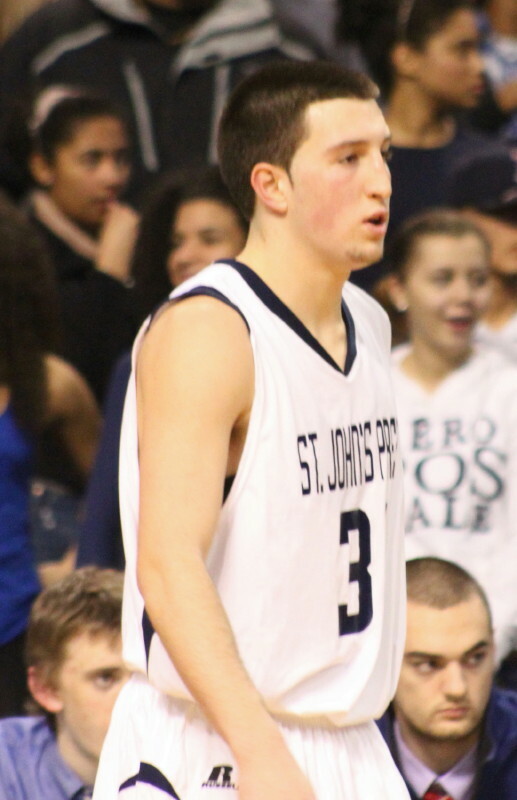 Mike Carbone (31 points) hit all five long ones he attempted pacing the Eagles. 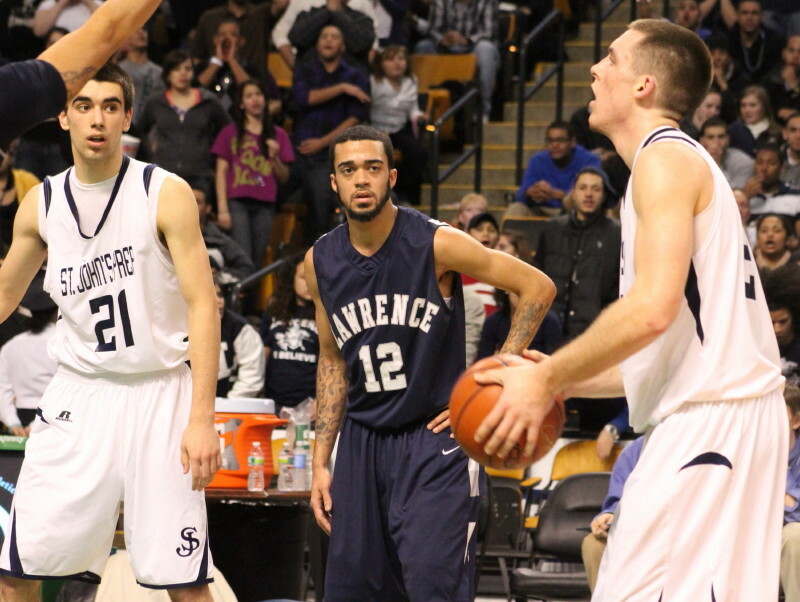 Steve Haladyna (#21) and Jaylen Alicea watch Pat Connaughton free throw attempt. You’d suspect that the Lancers would have paid more attention to Mike but with the state’s best player (Pat Connaughton) also on the floor, and demanding attention, it wasn’t that easy to do. In fact, afterwards, Mike credited Pat for opening up shots for him. With a 12-point cushion going into the final quarter, Coach Connolly wisely turned just about every possession over to Pat Connaughton (28 points). The Notre Dame recruit was able to kill the clock and get to the basket or the foul line for much of the 4th period. Pat tallied eight of the Eagles first twelve points in the last quarter and St. John’s had a comfortable lead (80-63) with 3 ½ minutes left. The first half was an entirely different (and uncomfortable) story for the eventual winners. There couldn’t have been a soul left in Lawrence from the crowd I saw. And could they make noise! I’ve heard the St. John’s student section but they’re organized. The Lawrence folks were just downright enthusiastic for what had become “their” team. And the Lancers rode that wave of pure support in the first half. Every basket received a “winning basket” full-volume roar. The Eagles had the lead only once (11-10) during the first quarter. Yadoris Arias’ two free throws at the start of the second quarter gave the Lancers a 25-17 lead. You began to wonder if a #15 seed could possible keep this sort of play up and reel in yet another high seeded team. St. John’s, however, has played big games all season. Who could forget the two with Central Catholic? Led by Pat, Mike, and Steve Haladyna (17 points), the Eagles erased that lead in less than three minutes with a 17-4 run. This activity gave St. John’s a 34-29 advantage but the Lancers rode the crowd and Jaylen to get back to within one (47-46) at halftime. It was announced during the second half that Jaylen had reached his 1000th point. I won’t attempt to describe that reaction of the Lawrence crowd to that news! 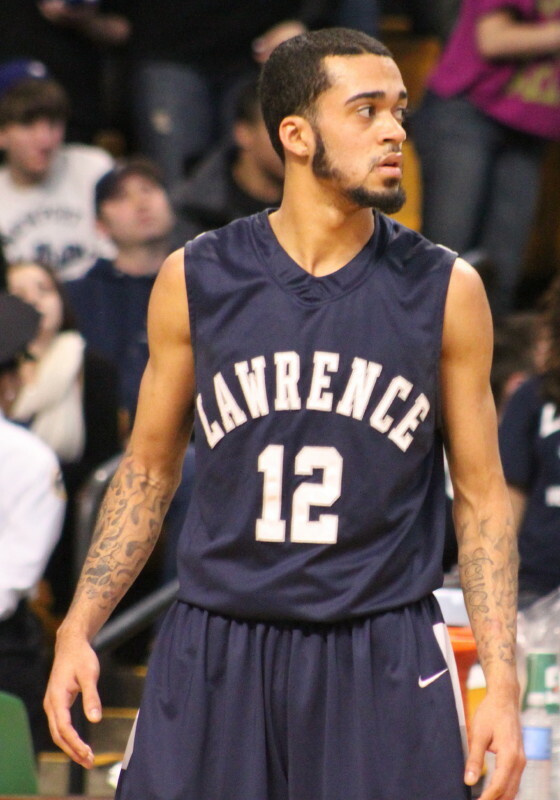 Jesse Hiraldo (6’6”) had an impressive first half (eight points) for Lawrence on the inside but foul trouble limited his second-half minutes. 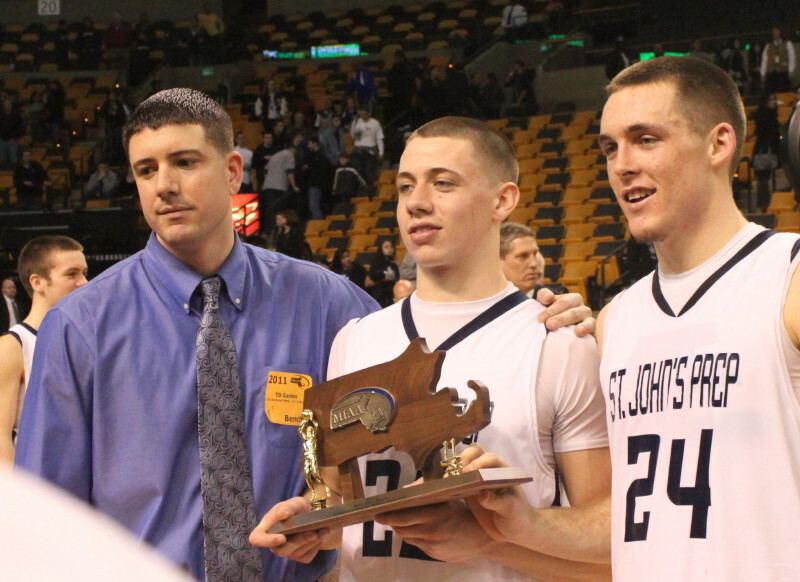 St. John’s moves on to the state semi-finals on Tuesday night (7:45PM) against Mansfield (24-2). I saw the Hornets rally from an 8-point deficit late in the last quarter to win by a basket over Newton North in the last three seconds in the game before Lawrence/St. John‘s. 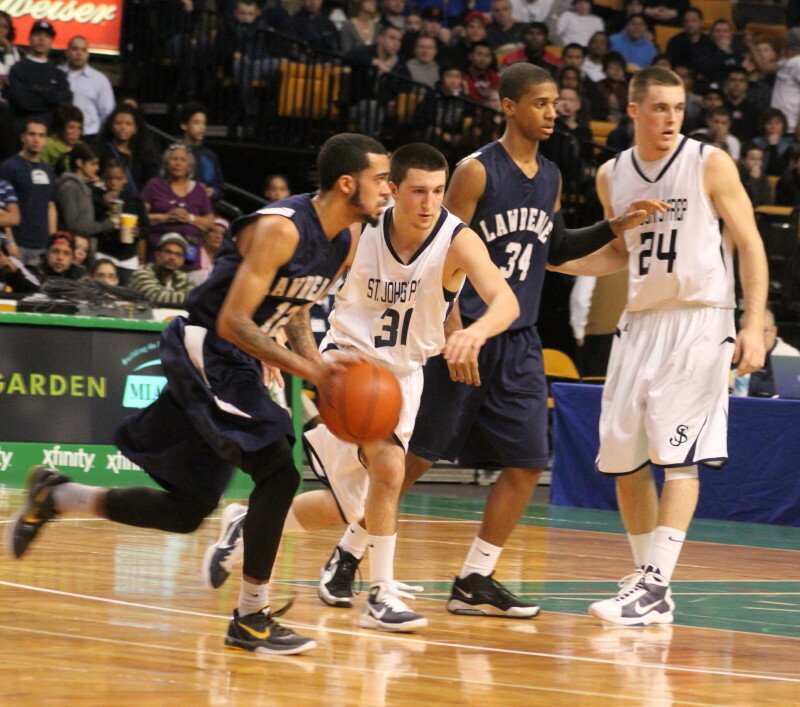 Mansfield will have to shoot a whole lot better to have any chance with St. John’s. Several of Mansfield’s starters were still shooting air balls late in the game and I even saw their best player (Mike Lofton) put up an air ball from the foul line.